Industry members donned their favorite full-skirted dresses, bobby socks, hair scarves, and suits—or in the case of Sony/ATV’s Troy Tomlinson, a letterman jacket—to honor the chart-topping single with a 1950s-themed party. An archway of balloons welcomed guests as they entered the party. 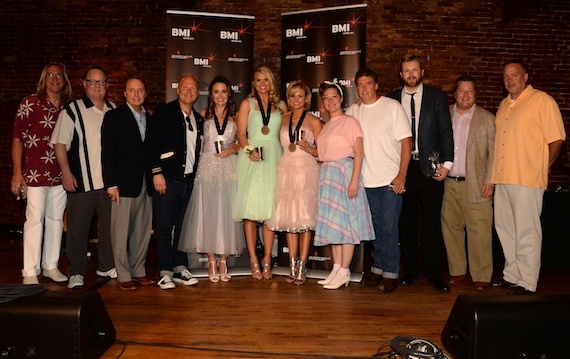 Tomlinson, BMI’s Jody Williams, Warner-Chappell’s BJ Hill, and Sony Music Nashville’s Gary Overton were among those paying tribute to the song’s success. It also marked another milestone for Lambert. “You signed with Sony/ATV 12 years ago today,” Tomlinson told the singer-songwriter. “There are very few real artists and it’s a pleasure to be in the presence of a real artist. You exemplify that.” To commemorate 12 years with the company, Lambert was gifted with a 1955 RCA Victrola record player and matching records case. Sony/ATV worked with American Pickers to find the pristine record player, and filled the records case with records from the Sony/ATV Tree catalog from the past 40 years. 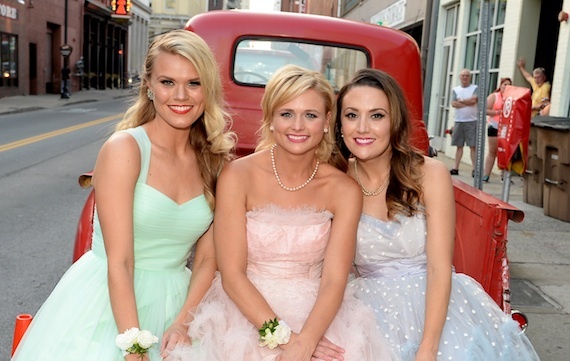 Overton reminded the crowd that Lambert is the only artist to debut all five of her first albums at the top of the Country charts. Her latest, Platinum, debuted at the top of the all-genre Soundscan chart, and sales of this album have been 30 percent stronger than that of her last project. A plaque was given to Lambert’s manager Marion Kraft, to commemorate the progression of Lambert’s career. “I’ve known a lot of managers and I’ve never met one more intimately and actively involved in the life of an artist and yet you are attentive to everyone in the industry,” said Tomlinson. The camaraderie between the three talented songwriters was on full display. “I feel like Miranda is a little sister because she was born on the same day as my little sister and they are both spitfires,” said Hemby. “You are a trailblazer and have set the bar really high. Galyon, who was recently named one of MusicRow‘s honorees for 2014 Breakthrough Songwriter of the Year, gave an emotional thank you speech during what was her first No. 1 party for her second chart-topping single (though “We Were Us,” co-written by Galyon, reached the chart pinnacle first, the No. 1 celebration has not yet happened). She gave thanks to her parents, God, and husband and songwriter Rodney Clawson. The party continued well into the evening as attendees danced and a full band played songs befitting the retro theme.